Dubai: His Highness Shaikh Mohammad Bin Rashid Al Maktoum, Vice President and Prime Minister of the UAE and Ruler of Dubai, on Saturday received His Highness Shaikh Mohammad Bin Zayed Al Nahyan, Crown Prince of Abu Dhabi and Deputy Supreme Commander of the UAE Armed Forces, at Zabeel Palace. They exchanged Ramadan greetings in the presence of Shaikh Hamdan Bin Mohammad Bin Rashid Al Maktoum, Crown Prince of Dubai, Shaikh Hamdan Bin Zayed Al Nahyan, the Ruler’s Representative in Al Dhafra Region,Deputy Prime Minister and Minister of Presidential Affairs. Also present during the meeting were Shaikh Abdullah Bin Zayed Al Nahyan, Minister of Foreign Affairs and International Cooperation, Shaikh Ahmad Bin Saeed Al Maktoum, President of Dubai Civil Aviation and Chairman and CEO of Emirates Airline and Group, other shaikhs, dignitaries, and senior civil and military officials. 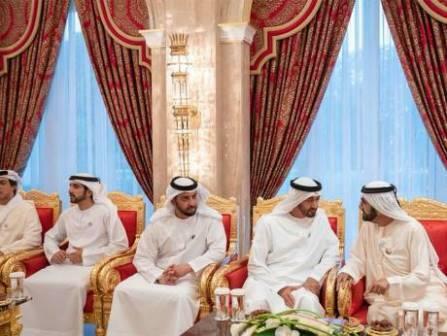 Shaikh Mohammad Bin Rashid and Shaikh Mohammad Bin Zayed accepted Ramadan greetings from Emirati dignitaries and top government civil and military officials. Shaikh Mohammad Bin Rashid and Shaikh Mohammad Bin Zayed joined other Shaikhs, top officials and dignitaries in performing Maghreb prayers. Shaikh Mohammad Bin Rashid hosted an Iftar banquet in honour of his guests.